Screenshots: Ratatouille, Cloudy With A Chance of Meatballs, Chocolat, MasterChef Jr. (Photo: Fox), and The Great British Bake Off (Photo: PBS). Graphic: Allison Corr. Food, glorious food. This time of year there seems to be more of it than any other month on the calendar. But what if your kid only likes main meals that are beige? What if too much of the stuff they eat comes out of a box? What if the only thing they can prepare in the kitchen is a Pop-Tart in the toaster? Fear not, as our AVC parents return to help induct your kid into pop culture that may help them see food as more than just mac and cheese in the blue box and stashed Halloween candy. And you know the stats on the importance of the family eating at least the dinner meal together, right? Trust us, it’s worth it. Even if the main course is still in the tan spectrum, or you end up at the same Mexican restaurant every single Friday night. The original Cloudy With A Chance Of Meatballs is a perfect kids’ book: not too long; beautiful, detailed illustrations by Ron Barrett; and best of all, a whimsical story by Judi Barrett about a town where food falls from the sky. In the book, a man tells his two grandchildren about Chewandswallow, a magical town where meals arrive like weather, only instead of rain or snow, it’s eggs, toast, and orange juice in the morning, for instance. This perfect utopia is ruined, though, when the weather turns erratic, first with bizarre combinations (Brussels sprouts and peanut butter?) and then with giant-sized food (like enormous pancakes, including one that lands on the school). Eventually the residents flee to start new lives elsewhere. 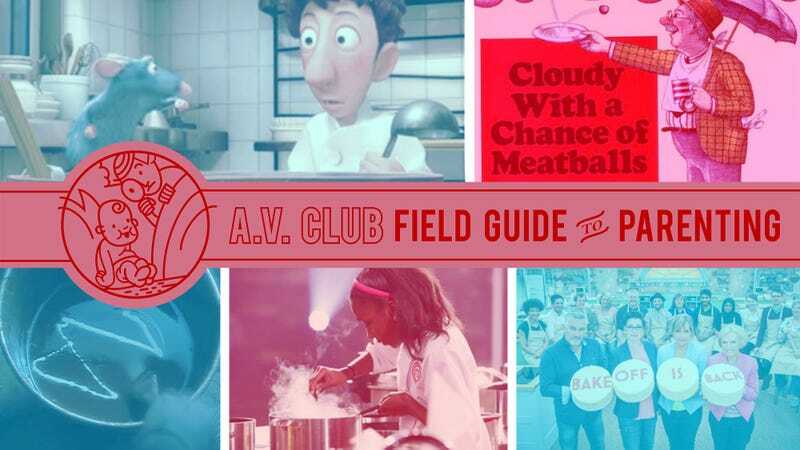 The book spawned two sequels, 2000’s fun-but-not-as-good Pickles To Pittsburgh and 2013’s totally skippable Cloudy With A Chance Of Meatballs 3: Planet Of The Pies. The former finds the grandkids visiting Chewandswallow, where a company is sending all of that surplus food to needy people. In the latter, the grandpa visits Mars and eats pies with martians or something. Like I said, it’s skippable. When my twins were infants, I was mostly home with them (except for some part-time work), which gave me time to cook that I can only daydream about now (while I’m busy doing this!). I was also a member of a food co-op, which meant I was swimming in fruit and gourds. As the babies switched to solid food, I got sick of buying them Gerber (plus it was expensive), so I started roasting and pureeing the multitude of gourds and mixing them with various fruits, keeping their diet to only these forms of produce. I started alphabetically, like with acorn squash and apple, butternut squash and banana. Then I suspected there were more inspired combos out there, so I started searching online for a baby cookbook. In all the message boards, Annabel Karmel’s appeared to be the clear favorite, and after buying it myself, I could see why. She also started with purees (I remember the first recipe of hers I ever made combined apples and blackberries), before moving on to kid-friendly pastas and casseroles. The transferring over of metric measurements was a little cumbersome, but still worth it. Nearly every Friday night for the last decade, our little family of four has had dinner at the same Mexican restaurant. It’s not that we love the food there. It’s fine—and on some days even delicious—but generally speaking, it’s nothing special. My wife and I do like the margaritas, but that’s mainly because the staff knows our order so well that they often have our drinks on the table before we’re even seated. No, the main reason we end every week at La Huerta is that we’re creatures of continuity. Seasons and circumstances change, but whether it’s a sweltering summer evening or a dark, chilly winter night, we’re always at the same place on Friday, eating the same enchiladas and chimichangas, sharing sections of the newspaper and swapping stories about our days. Our son is 16 now, and our daughter 13. They’ve lived in the same house in the same Arkansas college town since they were born, which means there’s a regular rotation of restaurants, stores, and civic rituals that they’ve been experiencing—and, we hope, enjoying—since they’ve been old enough to notice such things. I suspect that all families have a similar set of “go-to”s, whether they live in a smallish city like ours or in a neighborhood in a major metropolitan area. But as our kids edge perilously closer to leaving home, I think more and more about what they’re going to take away from their time with us. If they’re anything like I was after I moved away, it’ll be the simple routines and the otherwise nondescript places that they’ll remember fondly, and even pine for. We’ve been filling boxes upon boxes of Proustian madeleines for our offspring, with all the places that we’ve taken them over and over. Continuing the move from fictional kitchens to real ones, there’s nothing like competitive cooking shows to bring out the latent chef in anyone—even kids. A great place to start is the deservedly popular Great British Baking Show, available on Netflix. It’s the kindest, gentlest form of reality competition, as all the competitors are polite and supportive, and even the judges go for positive reinforcement over negative (this is why we’re starting here over Ramsay’s Kitchen Nightmares, say). Plus, the desserts are creatively incredible confections. Start with season one on Netflix, where the kids will undoubtedly root for teenaged Martha, who made time for GBBS appearances in between her upper-level exams.